The University of Abuja Teaching Hospital (UATH) chapter of the Joint Health Staff Union (JOHESU) held a peaceful protest over nonpayment of their two months, April/May 2018, salaries. The protesters, who carried placards and banners assembled at the front gate of the hospital chanting solidarity songs and demanded for their unpaid salaries. 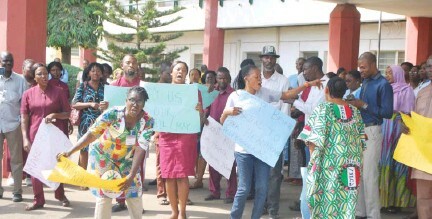 The hospital’s branch chairman of JOHESU, Comrade Stephen Oricha, while addressing newsmen, said the staff were protesting for three days as directed by the national body of the union to demand for payment of their two months salaries. He said there were two issues on the table when the union went on strike in April/May last year, over which he said the Federal Ministry of Health took the union to court. “In the court, we were told that some agreements have been reached with the court even though we have not seen the circular but we believe and hope that this time around the ministry will obey court order and those issues,” he said. The JOHESU chairman said he hoped that after the three days protest, the ministry would respond to their demand. “And if they fail to intervene, we shall call on the press to let them know our next line of action, but for now, we will still keep it in our mind,” he added.